And as Falk probes deeper into the killings, old wounds start bleeding into fresh ones. For Falk and his childhood friend Luke shared a secret... A secret Falk thought long-buried... A secret which Luke's death starts to bring to the surface. If there was an X-Factor for crime debutants, then Jane Harper would get a standing ovation and cries of ‘you’ve just got something special’ from ecstatic judges. And we’d all definitely want to see more. Harper’s remarkable debut, set in the parched rural landscape of Australia, combines exquisite slow-build storytelling with a terrific sense of place and richly drawn characters that provoke a range of emotions in the reader. Federal Agent Aaron Falk returns to his drought-stricken hometown Kiewarra for the funeral of a childhood friend. Luke Hadler seems to have broken under the strain, shooting his wife and son, then himself. It’s a shocking event, even in a community that faces life and death choices every day. Falk’s visit is meant to be fleeting – he has no desire to linger in a place he and his father fled twenty years before after accusations swirled following the suspicious drowning of a young woman. But as Falk and a local detective begin to doubt the murder-suicide scenario, he stays, only to find that his digging into this latest tragedy unearths secrets from the past, from a time when Luke provided him with an alibi. With townsfolk who still harbour plenty of unpleasant beliefs, and a community struggling to survive in a tinder-dry landscape, Falk must tread a tightrope as he lights a match to seek the truth. The Dry is a tale of a man versus the environment, a town, and his own past. Beautifully written, Harper teases us with trickles before we grab the bottle to gulp our way to an exciting finish. Note: this review was first published in Mystery Scene. 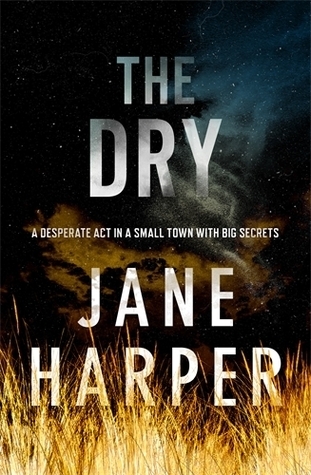 This weekend, THE DRY won yet another award, the Ned Kelly Award for Best First Novel.